Soft and tender, Almond Cookies melt in your mouth. It’s no wonder these cookies have endless variations from across the globe! They’re simple & delicious! 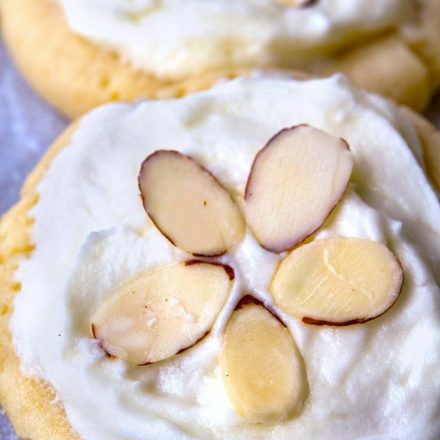 These bite-sized Almond Cookies pack a solid almond flavored punch as they melt in your mouth. 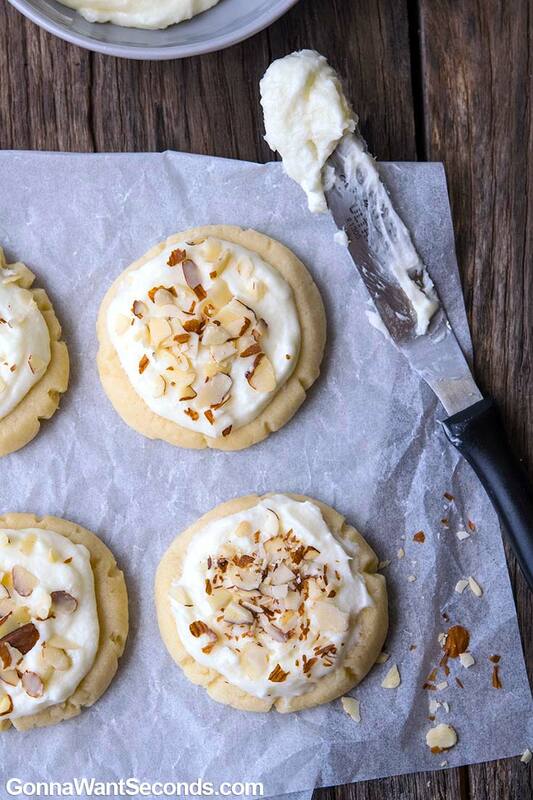 The easy frosting tops the buttery Almond Cookies with perfectly balanced flavor and sweetness. Variations like crispy Almond Cookies are popular across the Far East and are the equivalent to the American sugar cookie. 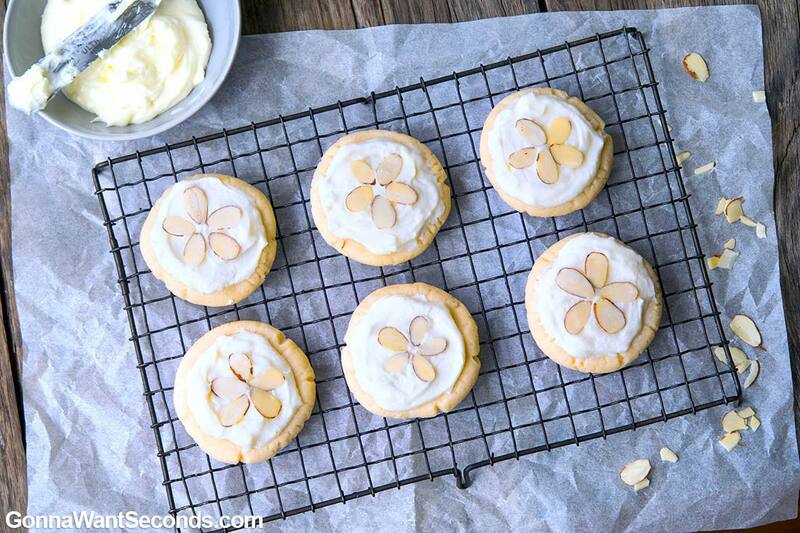 With these Almond Cookies Chinese tradition definitely influenced their creation. Originally made with walnuts, these cookies symbolize good fortune and are traditionally given as gifts for friends and family around New Years- though I love them any time of year! They have a rich history and have multiple versions through Europe and Asia each country has its unique twist. 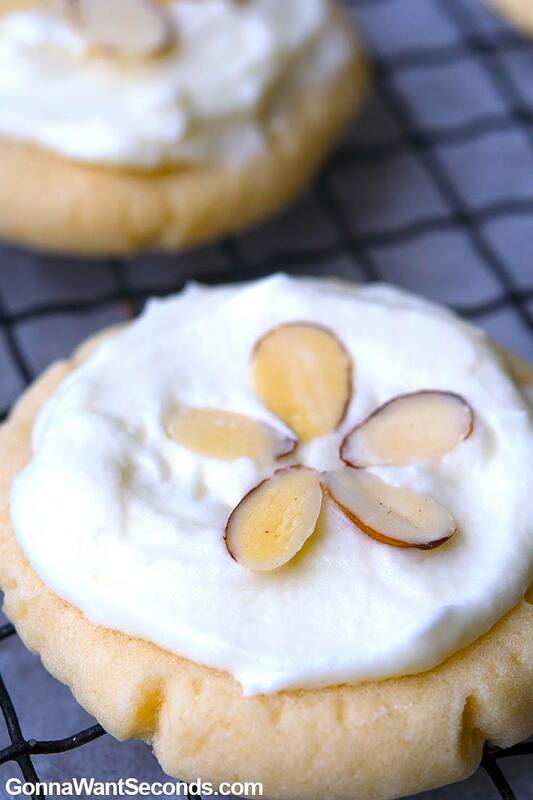 For example, Almond Cookies with almond paste are a traditional Italian variation that often uses a meringue instead of baking powder or soda to provide a rise in the cookie. 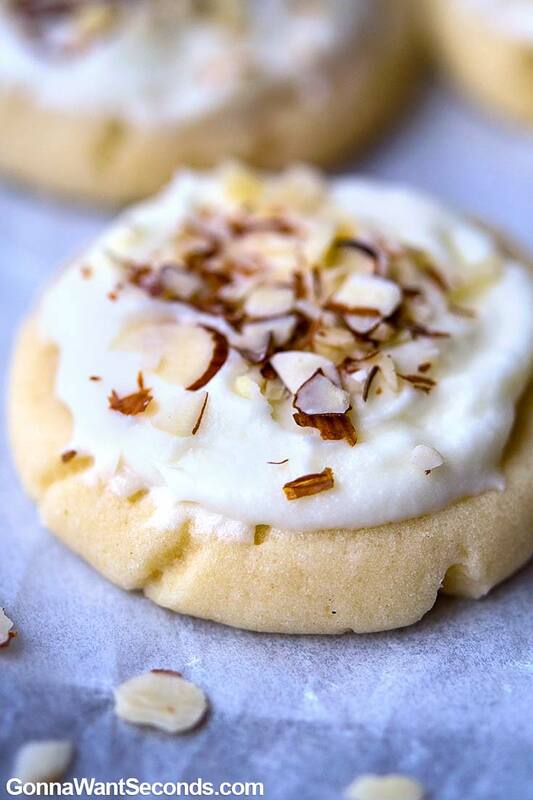 One thing is for certain- there aren’t many wrong ways to make an almond cookie! 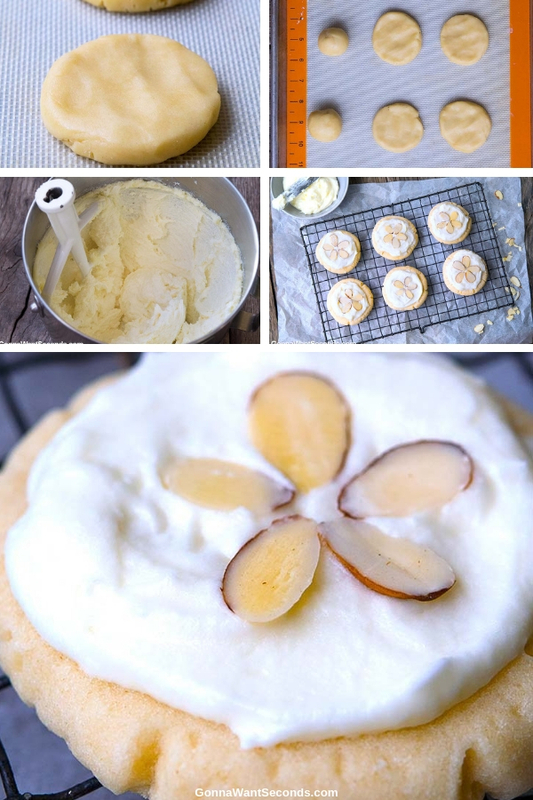 How to Make Almond Cookies? 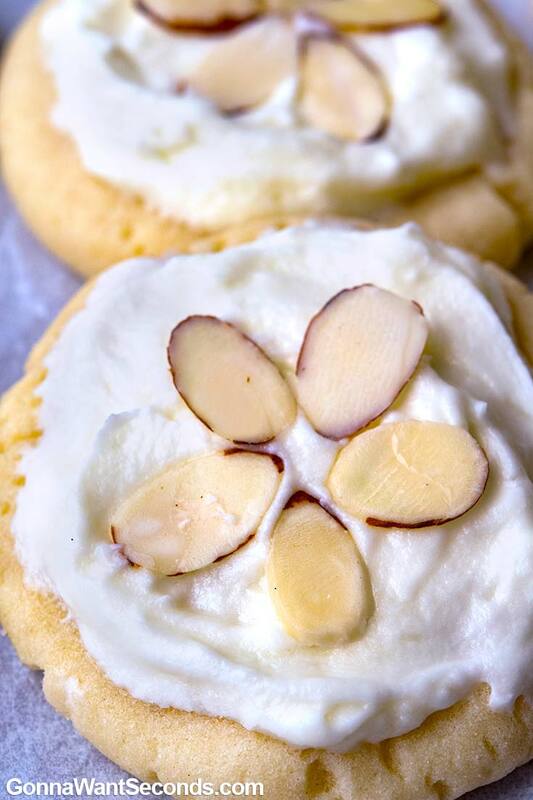 Almond Cookies come together easily with simple ingredients. Begin by combining flour, baking soda, cream of tartar, and salt. Then bit butter, and sugar until they are light and fluffy. Add in the eggs one at a time, followed by the almond extract. Don’t over mix! We want to keep as much of the air we just whipped into the butter and sugar as we can. Stir in the dry ingredients, again careful not to overwork the dough. Drop by spoonfuls on a cookie sheet and bake. After the cookies cool, spread with frosting and top with almond slices. 1. Preheat oven to 350 degrees. 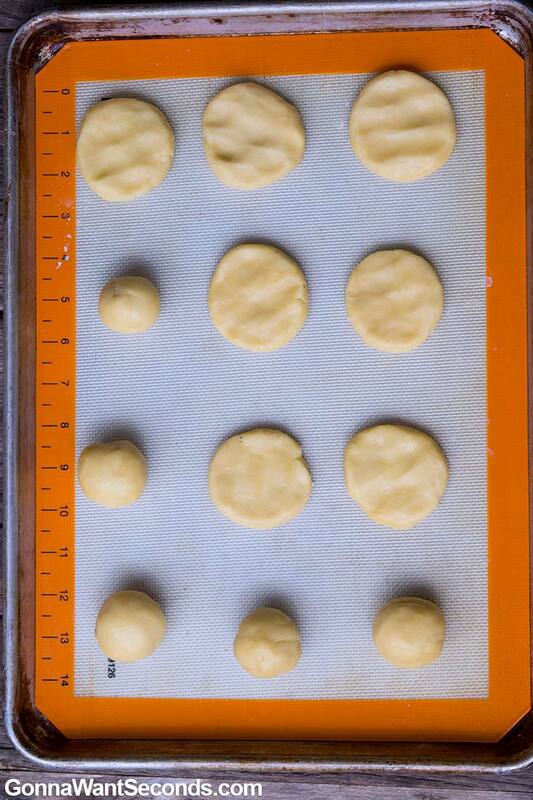 Line baking sheets with parchment or silicone mats. Whisk together flour, baking soda, cream of tartar, and salt. Set aside. In another mixing bowl, beat together powdered sugar, granulated sugar, and butter with electric mixer until light and fluffy. Beat in oil, eggs, almond extract, and vanilla. Gradually add flour mixture and mix until incorporated. 3. Roll dough into ping pong sized balls. Flatten with bottom of glass dipped in sugar. Baked cookies for 8-10 minutes or until the center of the cookie no longer looks wet. Cool on baking sheets for 5 minutes then transfer to a wire rack. 1. 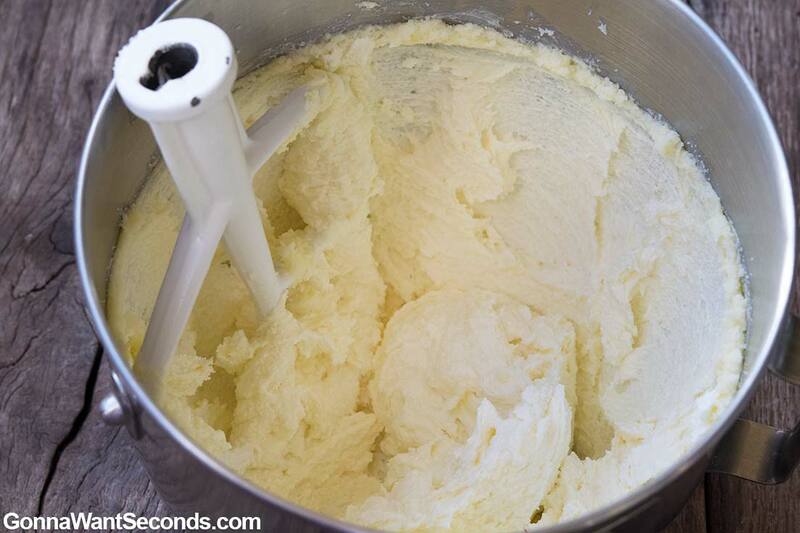 In a large mixing bowl, using electric mixer, cream together the butter, and milk until light and fluffy, about 1 minute. Gradually add powdered sugar, mixing until evenly combined. Mix in vanilla and almond extract. Frost cookies immediately. How Are These Different From Chinese Almond Cookies? These cookies differ from Chinese Almond Cookies in a few ways. Traditionally, Chinese recipes call for lard and often use ground almonds instead of flour. However, the cookies vary so much from region to region, it’s tough to say exactly what a true Chinese Almond Cookie is! Over the years, various nuts and seeds have been used, including sesame seeds, walnuts, and cashews. I love this recipe because I think it brings out great almond flavor while creating lovely soft Almond Cookies that melt in your mouth! What Are Almond Crescent Cookies? With their iconic shape of a crescent moon, Almond Crescent Cookies are yet another variation on the original Almond Cookie that originated in Eastern Europe. Typical of European cookies, these delicately flavored treats are more biscuit-like- think shortbread texture. They’re popular during the holidays and are often coated in powdered sugar. 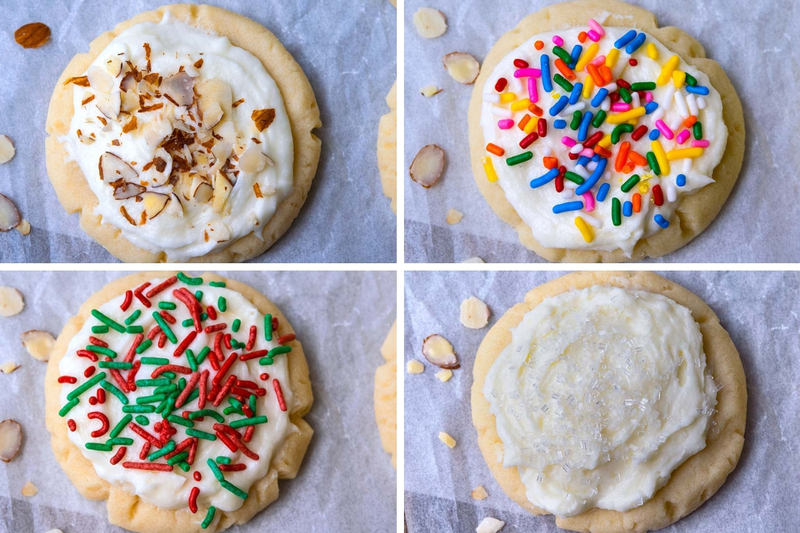 Can You Make Almond Cookies Ahead Of Time? 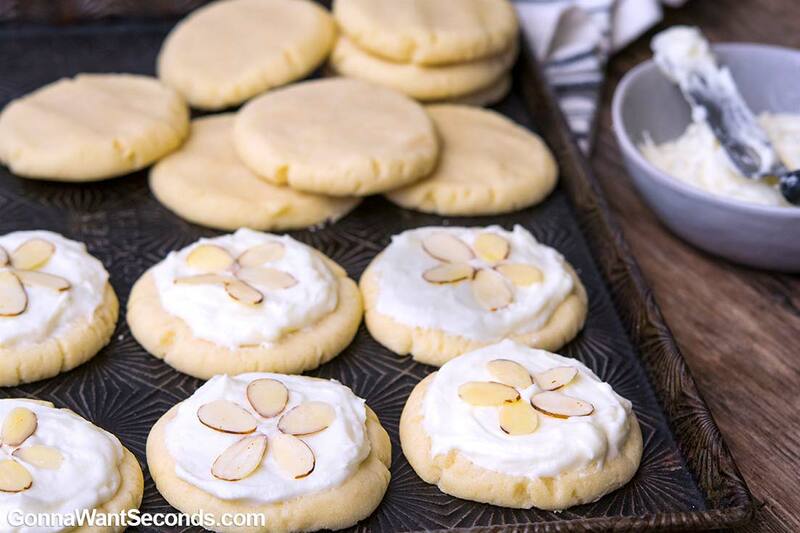 This Almond Cookie recipe only improves with time! The almond flavor deepens after baking. A crucial factor in the successful storage of these cookies is to use an airtight container. They will dry out quickly if left unsealed. Another cookie storage tip is to tuck a piece of fresh white bread in with your cookies. The moisture from the bread will be gradually absorbed by the cookies, keeping them nice and soft. Also, make sure your cookies are cooled completely before putting in the container! How Do You Freeze Almond Cookies? When you freeze cookies, you can either freeze before or after baking. To freeze baked cookies, allow them to cool completely! Residual heat in the cookies will result in ice crystals in the frozen cookies and disappointing texture when you serve them. Once cooled, stack several cookies together and wrap them in cling wrap. Place the wrapped cookies in a freezer bag. This double layer of protection will help keep the cookies soft and moist. I would suggest freezing without frosting. It only takes a few minutes to put on and will have a nicer texture. Well-wrapped frozen cookies will last about 3-4 months in the freezer. Freezing in dough form is super easy. Once you’ve made the dough, scoop it onto cookie sheets lined with parchment paper or a silicone mat. You can put the dough much closer than you would if you were baking (just not touching) so you can get more on a sheet. Put the sheets into the freezer to harden- usually about 30-60 minutes. Transfer the dough into a freezer bag and don’t forget to label them! To prepare, put frozen cookie dough on your cookie sheet and bake as instructed. You’ll need to add a couple of minutes to the original bake time. Allow to cool, top with the frosting and almonds, and enjoy! Your cookie dough is good for about 2 months in the freezer. 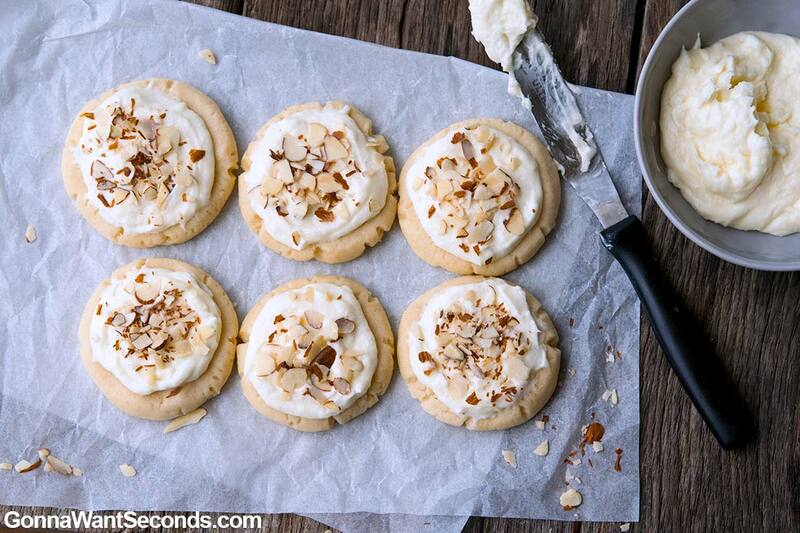 What Do You Serve With Almond Cookies? These cookies simply beg to be served with a nice cup of tea or coffee. Their delicate flavor doesn’t compete with what’s in your mug. Of course, a cold glass of milk is never a bad choice with cookies of any variety! Side note- the Chinese typically served these at the very end of the meal- after dessert- as a way to cleanse the pallet as people left the table. What a delicious version of an after dinner mint! If you’re looking for something chocolatey, you can swap out the frosting for chocolate. Simply melt dark or milk chocolate chips on low power in the microwave in short 20-30 second bursts, stirring in between. Remember, chocolate should never get too hot to touch! Go low and slow! Dip half of the cookie into the melted chocolate and sprinkle with chopped almonds. I usually make them so they look like ½ moons as opposed to covering the entire top half, though they’re delicious either way! Sure to bring joy in every bite, these coconut and chocolate cookies bring you all the flavors of the traditional candy. Almond Joy Cookies come together in mere minutes to create soft, moist, decadent treats! Leave the candy bars on the shelf! I promise you when you try these Almond Joy Bars, you won’t go back to the prepackaged version. Everything is better homemade! Low Carb Variation: It’s easy to lighten the carb load and create healthy Almond Cookies! To make Almond Cookies Keto compliant, you’ll need to use an alternative flour and sweetener. Obviously making Almond Cookies with almond flour makes good sense and adds another layer of almond flavor. Almond flour and all-purpose wheat flour can be substituted on a 1:1 basis. As far as sweeteners go, use your favorite sugar-free sweetener with the substitution rate as suggested by the brand. Stevia is a favorite of mine and holds its flavor well in the baking process! Preheat oven to 350 degrees. Line baking sheets with parchment or silicone baking mats. Whisk together flour, baking soda, cream of tartar, and salt; set aside. In another mixing bowl, beat together powdered sugar, granulated sugar, and butter with an electric mixer until light and fluffy, about 1 minute. Beat in oil, eggs, almond extract, and vanilla. Gradually add flour mixture and mix just until incorporated. Roll dough into ping pong sized balls. Flatten with bottom of glass dipped in sugar. Bake cookies 8-10 minutes in preheated oven, or until the center of the cookie no longer looks wet (Cookies won't brown).Don't overbake! 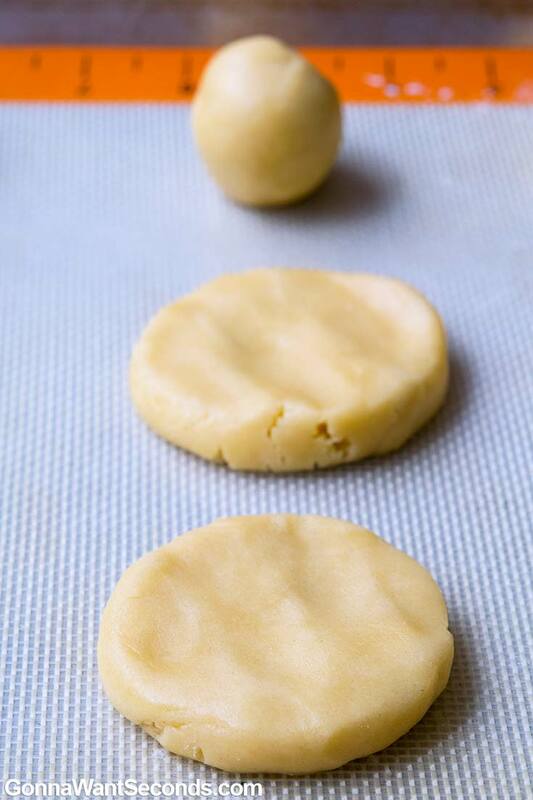 Allow cookies to cool on baking sheets about 5 minutes then transfer to a wire baking rack to cool completely. Meanwhile, make the frosting; with an electric mixer, beat butter until smooth and creamy. Add almond extract and salt. Add powdered sugar in 1-2 cup increments until combined. Add milk and mix until smooth and spreading consistency. 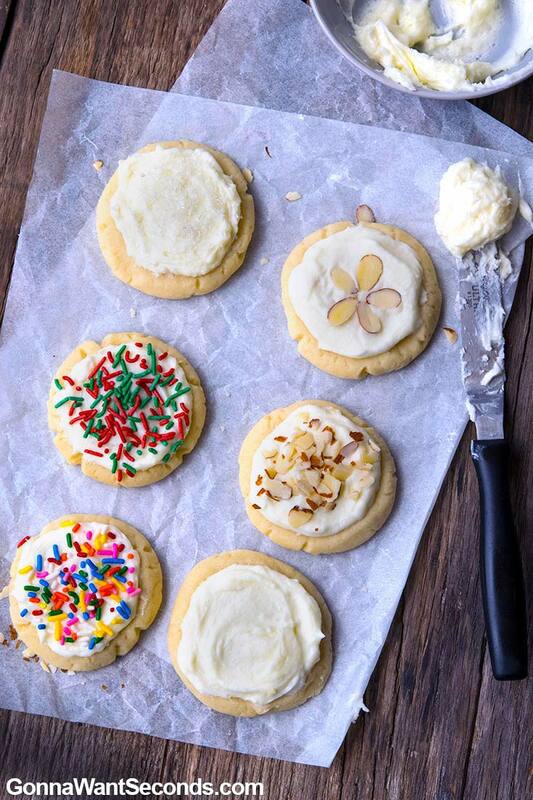 Spread over completely cooled cookies and top with sprinkles. I would definitely try this. I love the crushed almonds and sprinkles on top! So cute! I won’t rate these because I haven’t made them yet. I do have some questions. This post references a glaze for these cookies in a few spots. I do not see a recipe for a glaze, just the frosting. Is there a specific glaze that should/could be used for these cookies. My other question involves a bar referenced on this post. You mention an Almond Joy Bar. There is no link for a recipe for it on this page. I thought perhaps it was on the page with the Almond Joy Cookies which are also mentioned on this page. It is not, but that page also references the bars with no link to a recipe. I tried searching your site for the recipe, but it doesn’t come up. Do you have a recipe available for Almond Joy Bars? Hi Lynn! Thank you for your interest in this post. The reference for a glaze was a typo. Sorry about the confusion, I will update and change it today. Sometimes I finish up a post when I’m far too tired! LOL. Almond Joy Bars are a post that we will be published within a few weeks. Since they seem to be a recipe you’re interested in, I will have our editor get them out asap 🙂 Thanks again for reaching out. I hope you try the almond cookies and enjoy them as much as my gang does!